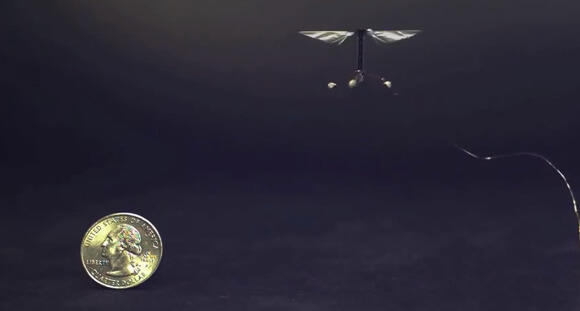 A tiny biomimetic robot, dubbed RoboBee, recently took wing under controlled flight for the first time. The robot is part of Harvard’s “Micro Air Vehicles” program led by principal investigator Robert Wood, and the controlled flight, years in the making, is no small feat. Wood hopes these tiny robots may one day be so cheap they are all but disposable. Swarms will fly reconnaissance, search and rescue, or research missions. They may even one day pollinate crops. RoboBee’s precursor first flew way back in 2007. Singularity Hub noted the project when it received a $10 million five-year grant from the National Science Foundation in 2009. The project’s goals are not meek. Not content with a miniature flying robot, the group wants to make swarms of the robots in which simple-minded, individual interactions result in higher level intelligent group behavior—just like the real thing. Currently, RoboBee weighs 80 mg, and its 3 cm wingspan clocks 120 wingbeats a second. The wings beat independently to move the bot laterally and allow it to hover. Finding a battery small and efficient enough to power RoboBee is a challenge, and in the video, the robot is still wired. 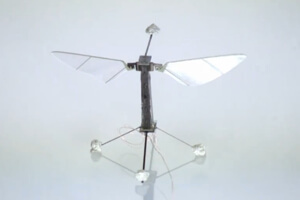 Even so, it’s a pretty awesome achievement, easily on par with other biomimetic winged robots like Robo Raven, Festo’s SmartBird, or Festo’s robot dragonfly. RoboBee is particularly impressive because designing and building insect-sized winged robots introduces entirely novel challenges not faced by larger robots. According to a paper written by the group, parts are much harder to fabricate and usually bespoke. Efficiency is the order of the day for all systems, as battery technology is still catching up with fabrication and computing miniaturization. Further, air currents are more chaotic at insect scales. Those are just some of the physical challenges—never mind figuring out how to algorithmically mimic hive mind. It’s a good example of why simply building miniature computers isn’t enough. It’s the synergy of software, hardware, and sensors that will eliven the future’s miniature machines. The cool thing about RoboBee is if the project successfully fulfills its objectives, it will have advanced researchers’ knowledge and skill in all three areas—whether or not it pollinates a single flower or ever flies a search and rescue mission. And if you’re looking forward to the day nanobot swarms do wondrous things, the learning we gather from RoboBee and other insect-scale robots may prove critical to making such technology a reality.